Are you sure you don't want to be the jealous type? You could draw so many more interesting expressions. Missed you over summer and am glad you are Baaaaaccckk! Woo hoo! I am in awe of every single person on the planet who does triathlons, mostly because of the biking. I could handle the swim and the run but the bike? No way man. Chocolate? If there were french fries at the end of the race I think I'd consider signing up too! Now I want both chocolate and friend fries. Without the race. Oooh, chocolate and fries would be a great way to end a race! Not at the same time, but a minute or so apart. I love your fun posts!!! I always see my hair in your drawings! ;) Congrats on the race!!! People cheering racers on is my favorite thing! 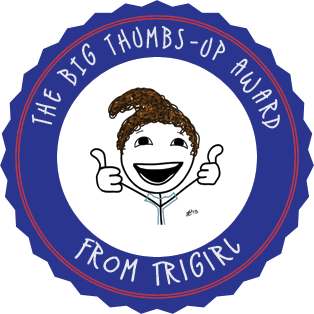 Three-cheers for Tri-Guy! Oh, and you, of course. Three-cheers two times, fool! Loved this. Hopefully you get a chance to catch up to life. I love cheerers too! I'm working on catching up. Great work sticking it out! Thank you very much, Holly! I love/hate my wetsuit! As always, LOVE your posts, drawings and recaps!! The bike rack thing reminded me of Forrest Gump... "Seat's TAKEN!" I totally noticed your swim caps. They look amazing. And the mask/goggles...do those have sparkles?!! Ha, I totally feel you on the wetsuit removal pain! That should be an event in and of itself! First-time visitor. Love the pics and commentary. Congratulations of your race. Thanks so much LaTonya and welcome! Yay you! That is fantastic! And "burning about 1000 calories uselessly in wetsuit removal" cracked me up. I did something like that yesterday trying to put on my Nike exercise tank. Unfortunately I don't think I burned any calories. And the bike rack thing? Why must life be but an annoying extension of high school at times? You are awesome bc I'm not doing all that in one day. I wish. But no. Thank you Karen :) Yup, I did have lots of chocolate. In fact, I'm still having lots of chocolate to replenish my calories 3 months later. You are awesome!!! Those illustrations are entertaining! Congratulations on your triathlons! Ok, so normally I hate the very ideas of a tri - but this one had chocolate, and you make it sound like FUN! It did indeed, and it WAS fun!